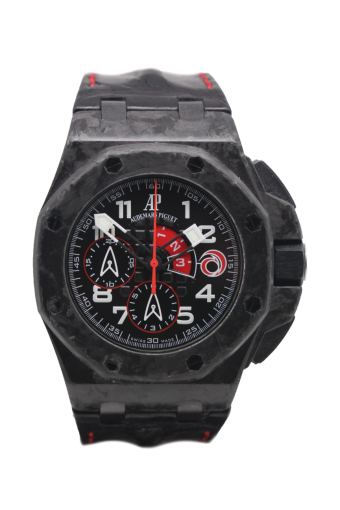 This important limited edition was Audemars Piguet first ever forged carbon watch and this particular watch is one of the very first produced of 1300 worldwide pieces and has the rare and higly collectable "error dial". Famously Audemars Piguet produced the dial on the first handful of watches with a white outline to the red Alinghi logo position at 3 o clock,production was immediately changed removing the white outline and upon service Audemars Piguet replaced the error dials with the correct later version,it is thought there are less than one hundred of these dials still intact today. This model was unveiled in 2007 and is obviously now completely sold out and appreciating in value. The classic black Audemars Piguet dial has a mega tapisserie center dial is black with red accents and white arabic hour markers. A 44mm watch case in black forged carbon houses the automatic flyback countdown chronograph caliber 2326/2848 movement with black ceramic crown and pushers. Strap is black alligator with red stitching supplied on a titanium tang buckle.